Friendliness and a tight-knit social community are what define us. We are an accommodating 55 and over retirement community for people with independent lifestyles. Amazing residents and caring staff combine to create an atmosphere of camaraderie that persists throughout the years. 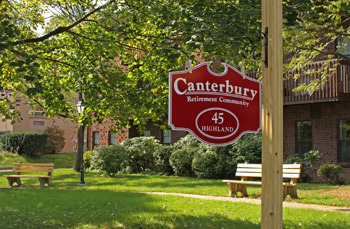 The Canterbury has created a retirement lifestyle of tranquil comfort and choices. We are designed with all the amenities to make your life carefree and secure. You can enjoy a well-deserved style of living, free from the burden of home maintenance and without the loss of independence and privacy. Living at the Canterbury is satisfying because we have given thoughtful consideration to all of the details that go into the ideal home which makes retirement comfortable and secure. You can also watch the video in Full Screen!